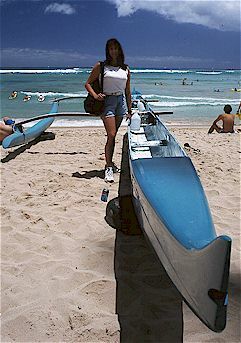 Waikiki. Honolulu. Pearl Harbor. Oahu. Diamond Head. Is there any city on earth that is so small, so remote, and yet so etched into our collective minds? In the past decade, Honolulu has become famous as the nicest city in Japan. I prefer to consider it in relation to it's place in the east/west world. which means that Waikiki is the beach of the east/west world. When you visit Honolulu, there's lots to do. There's the Bishop Museum, which has the world's best Hawaiian and South Pacific artifact collection. It's well worth a visit. Shopping is popular, of course. From Gucci and Donna Karen, to tacky souvenirs. From Hawaiian art to K-Mart. It's all here. Diamond Head is the Dramatic Backdrop to all Waikiki activities. I'm always looking to supplement my collection of Hawaiian music, so we visit Borders Books. Borders must have a thousand Hawaiian titles, and over fifty of them are in listening booths. I never leave with empty hands. Food is a major past-time as well. 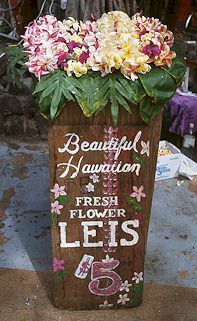 Hawaiian food is excellent, and readily available. Not to worry though, every corner of the world is represented here, and if you don't like any of those, Hawaiian chefs have perfected 'fusion' cuisine, the ultimate east/west blend of flavors. But inevitably, you make your way back - like everyone else - to the beach. To the smell of cocoa butter. To the crossroads of the east/west world. To sit and wait. And watch. And be watched. Japanese girls oohing and ahhing and taking pictures to the left of you. Midwestern tourists wearing baseball caps and white socks to the right. European men are baking in the sun with their bikini briefs climbing up their crack. And the natives are just hanging, laughing, and trying to make a buck by taking your picture with a parrot! It's easy to fall into a rhythm. Swim, sun, surf, shop, siesta, stare, snicker, stare some more, salivate, slurp a drink - then start again. At least till it rains. It rains quite a bit here. It's funny watching people lay everything out, then a short rain comes, and they pick everything up. Then the rain disappears, and they lay everything out again. Just like shampoo. Rinse and repeat. Where are the keys to this thing? Moonlit Palms But the rains stop at night, so we wander the streets of Waikiki, amazed at the mix of people. People-watching in Waikiki is world-class. Every race, creed, and color converges here. Unlike Singapore or California, inter-racial relationships are the norm in Honolulu (not the exception). This is probably because the people here are multi-racial themselves. In fact, the bloodlines in Hawaii are so mixed, you could argue that masturbation is an inter-racial act. The best show in Waikiki is the nightly parade of streetwalkers - a veritable Noah's ark of sexual preferences, accompanied by the rhythms of the street musicians, and the gawking of the tourists. And when you've had enough of people, you can sit on the beach in front of the Hilton Hawaiian Village. 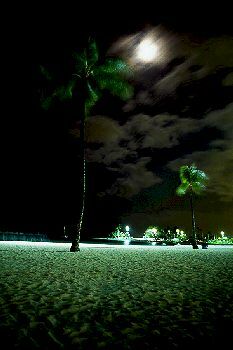 There, we were able to listen to slack key guitars from the hotel bar, as they mixed with the sound of waves, and palms rustled in the moonlight.